Baby Cheyenne made her debut like a boss approximately 2 weeks ago at 38 weeks. She couldn't careless when her due date was, she was ready to get out of the oven now! You can read more about her birth here. Needless to say, she has already captured her hearts and yes, i haven't slept in awhile so i hope this post is not riddled with grammatical errors. O.K., on to the nursery. 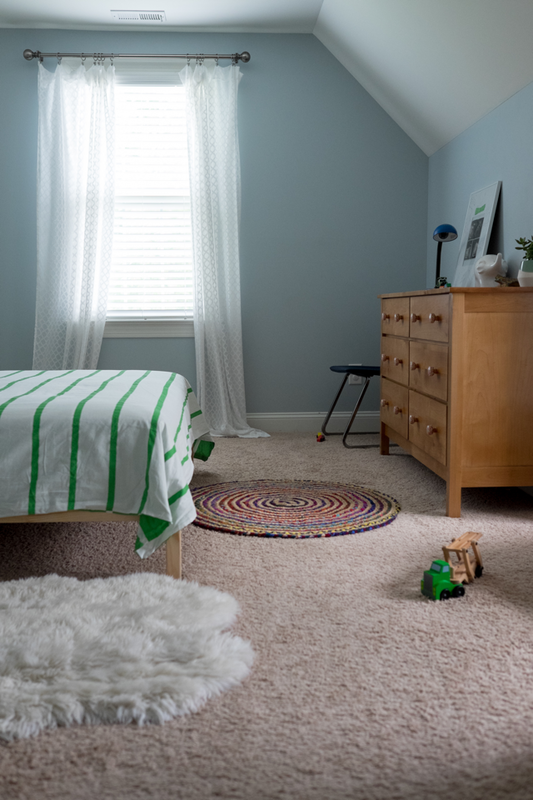 As i mentioned in the post below, the nursery used to be big brother Ian's room, but he is now sharing room with his brother, Zion. 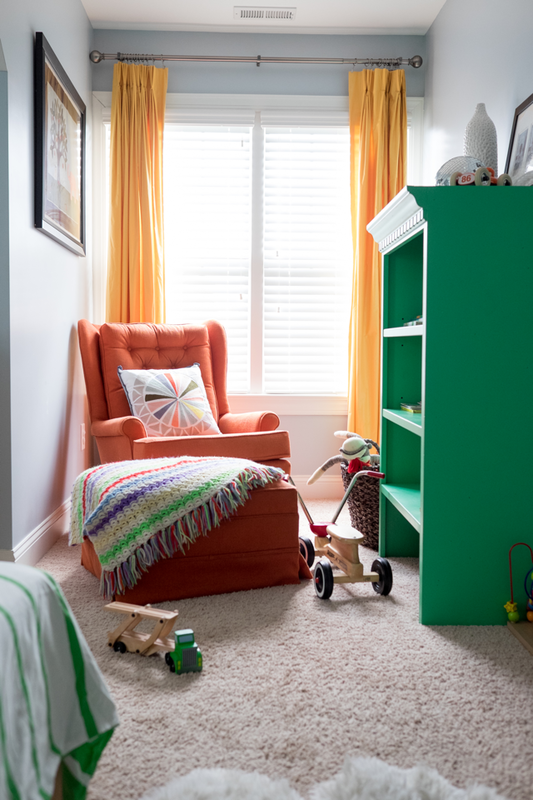 Although not quite yet completed, I was able to make a couple cosmetic changes to the space before baby Cheyenne arrived. 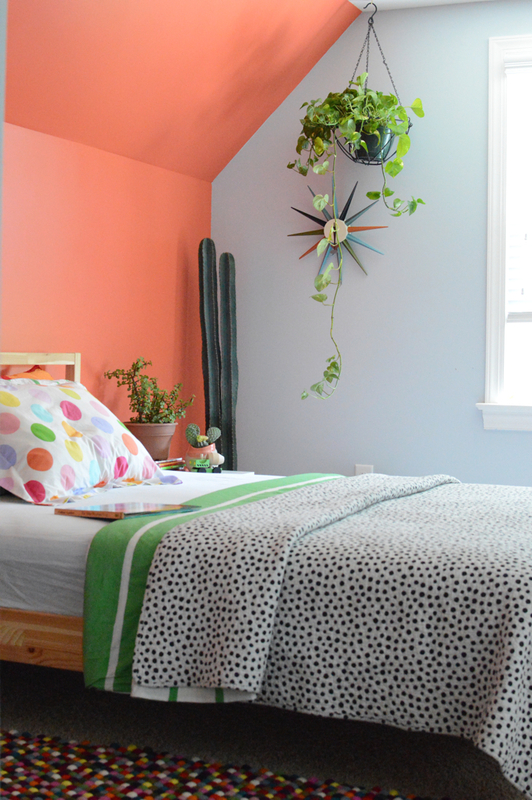 I splurged on the Arty wallpaper from Pierre Frey to create a fun and whimsical feel in the dormer which got a makeover. I also love that it pairs nicely with the existing drapery. This is what the dormer looked like before. I chose this crib because of its simple lines. 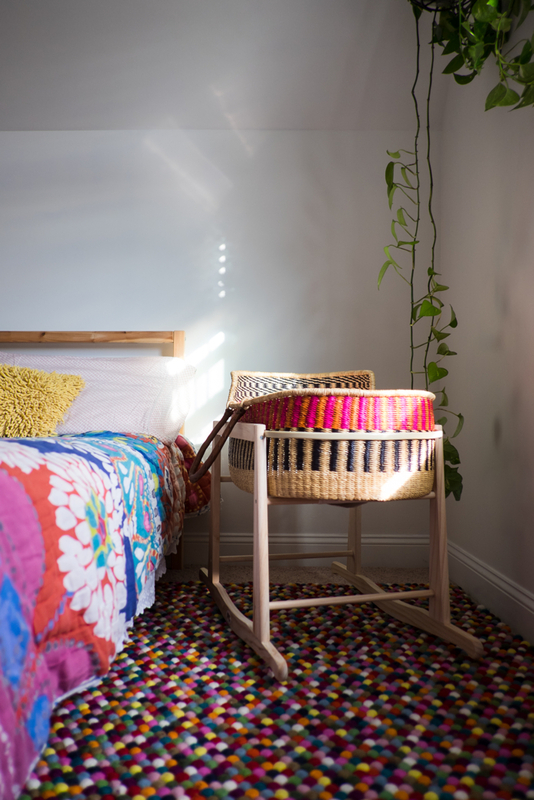 a bit of Scandinavian vibe in here and i love how the wooden and woven pieces look against it. Of course there are still bold colors all around in the space. 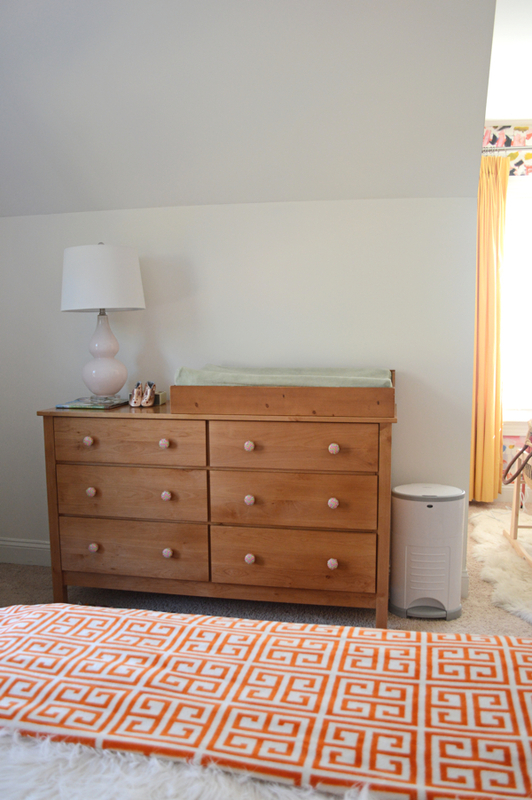 The dresser and changing table combo is from Land of Nod and i've had it since Zion was a baby. The knobs are a diy I completed a couple years ago and i plan on updating them. The diaper bin pictured works beautifully with regards to trapping scent but i wish it were just a bit bigger. The lamp and rocking chair are vintage finds. One of my favorite pieces in the nursery is this bassinet. 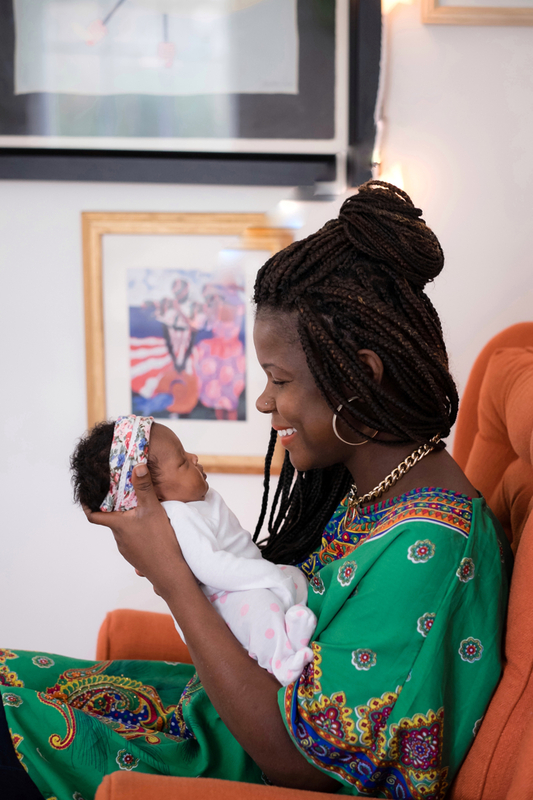 It's handmade from a wonderful company called Design Dua and I love the African inspired nature of the design I chose. 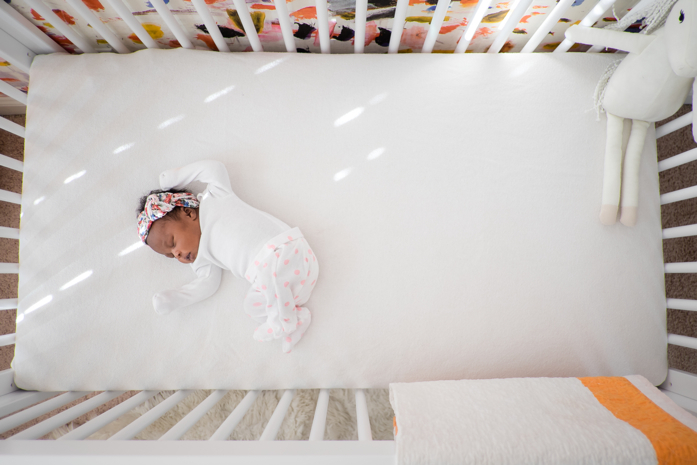 The rocking stand makes it convenient to move around and add the perfect height to reach over and soothe baby back to sleep. The chunk of the room is eaten up by this bed that was already in here when the room belonged to Ian. I decided to leave it in the space so I would have a place to sleep that was close to baby Cheyenne. Also the wall behind the bed used to be a tangerine accent color. The rocker that keeps on giving. I have already spent countless nights and days and mornings breast feeding and rocking baby Cheyenne in this rocker that i thrifted years ago when this space was then Ian's nursery. 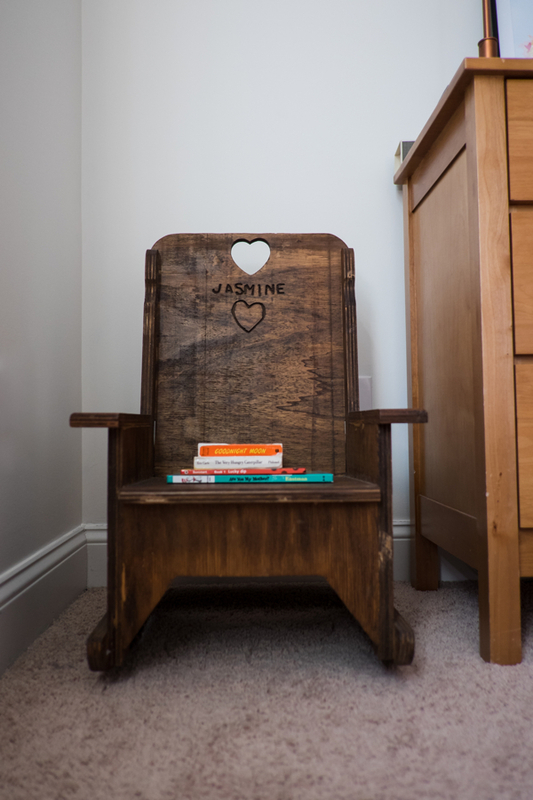 I also couldn't believe my luck to find this vintage hand made rocker with Cheyenne's middle name carved in it plus the heart shapes. Our darling girl. We love her so so much! And there you have it. I'll share more of the nursery once the other updates are made. Have a wonderful weekend! 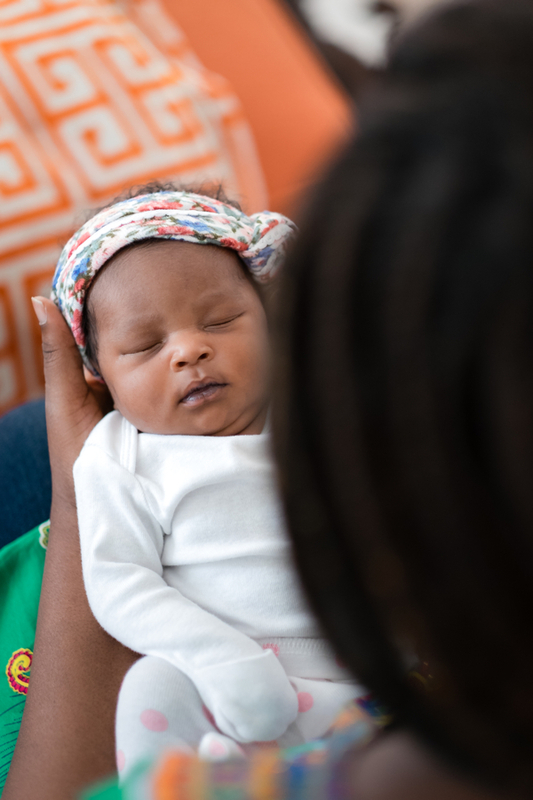 What a gorgeous baby- congratulations and I wish for you a sleepy baby so you can get some shut eye! 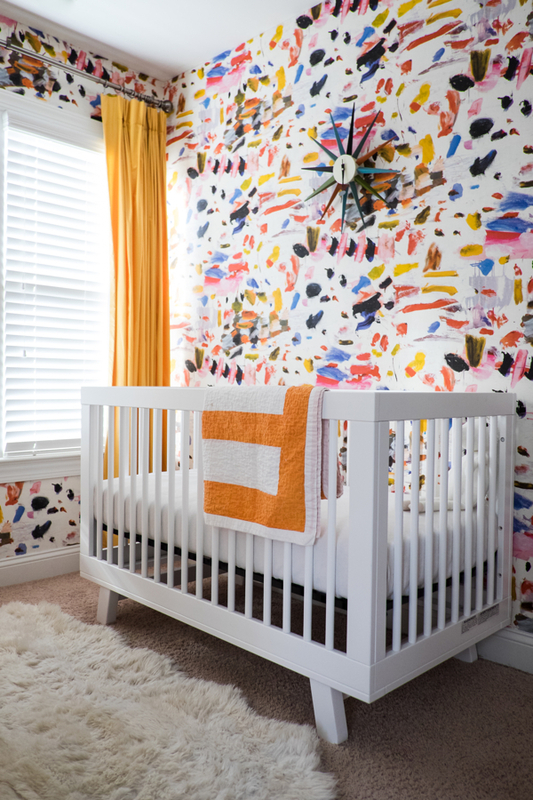 The nursery is spectacular- fab wallpaper. Great call. Enjoy every phase because, no joke, it goes by in a blink of an eye. Best! Beautiful baby girl. I see a Jonathen Green painting on the wall. He's such a great artist. Thank you! It's actually a calendar pic of a piece by Jonathan Green and I framed it:-). Yes, love his work!! Oh, Stacey, I know I've already said this, but she is so, so, precious. 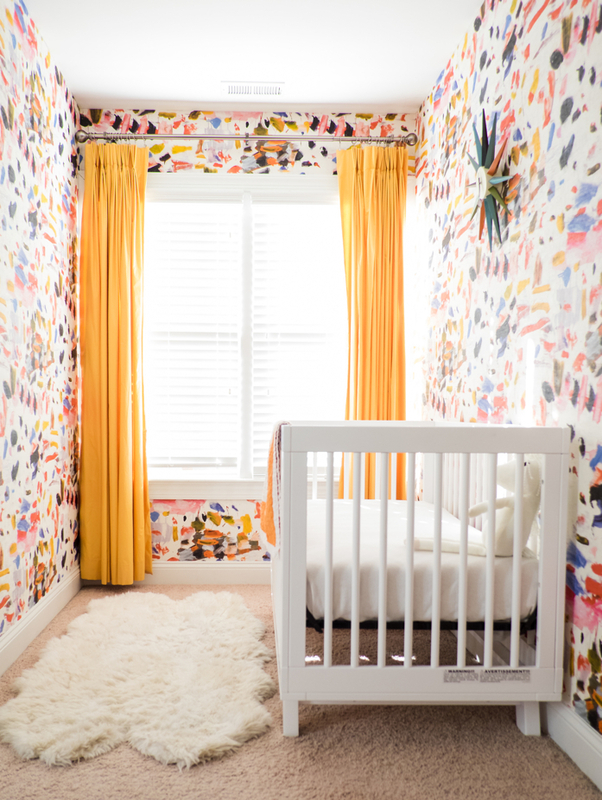 The nursery is just magical, and I absolutely love the wallpaper. Absolutely beautiful! 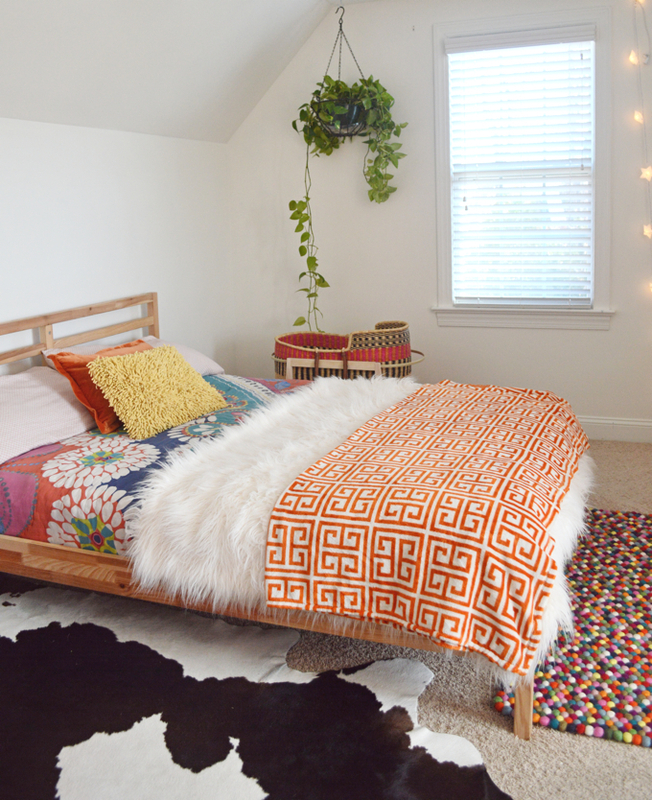 You, your babe, and the nursery! she is insanely precious!!! and super lucky to have that amazing room! 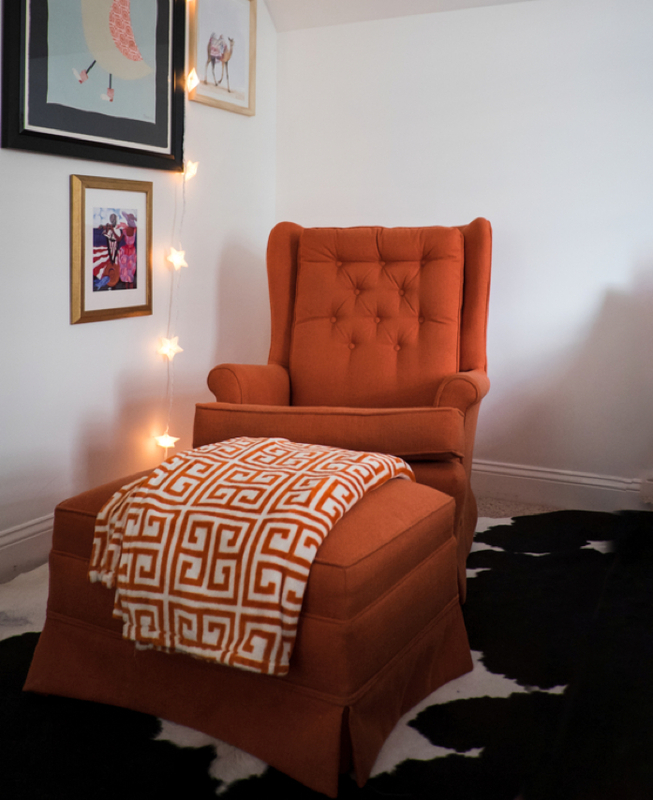 I absolutely love every detail of this space, but most of all adore your little Cheyenne!!! !